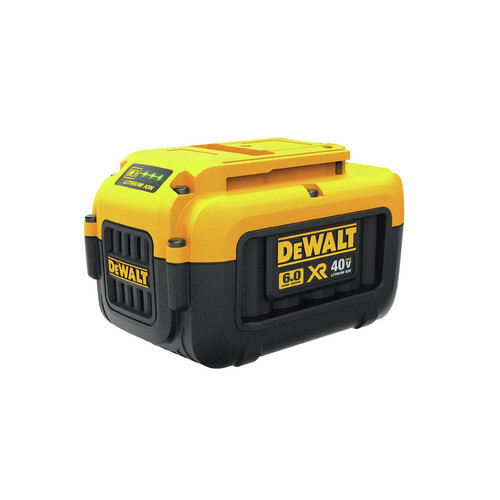 The Dewalt DCST990H1 40V MAX 6.0 Ah Cordless Lithium-Ion XR Brushless 15 in. String Trimmer features a variable speed trigger to give you precise speed control when needed with power and performance to tackle thick growth. The dual-line bump feed head clears a full 15 in., and the patented gear drive design amplifies torque enclosed in a metal gear case for high durability. I wanted to replace a Black and Decker that had battery issues. I am a fan of Dewalt and this trimmer works great. I highly recommend for large jobs. I would their smaller trimmer for lighter duty however. Very Impressed. Never expected it to be this good. Never have had a bad Dewalt. This is a replacement for a Core trimmer 2 years old, my nabor & I each had a Core and both failed after 2 years. Core said they would fix his for $150, Ye both boujght new trimmers. I had the blower h hedge trimmer and love them both. The line trimmer came with a u amp hour battery, so I mow have 3 batterys. I sold my Craftsman 4 stroke trimmer because this cordless has the same power but way less weight. Now I use it 10 times more than the gas ones because I don't have to check the fuel, (mix gas and oil if low), prime it, choke it, start it, let it warm up then use it. With the cordless DeWalt you just pull the trigger! So it gets used way more often. Im very happy with the unit, the other thing is the gas trimmer would make my hand go numb because of the vibration of the gas engine and it could also burn your leg if you weren't careful. My wife uses this too and I don't have to worry about someone using the wrong gas or not getting it started! Use safety glasses because this thing is a beast and on the high setting it really goes. The battery lasts longer than I do and charges fast. The best idea on batteries is also the built in power gauge. I fully charged it , trimmed all around house, 2 sheds, went up my road, went around trees in the yard and still showed 2 bars of charge. I'd still probably be pulling the cord to start my other one. Slip the battery in and you are off and running. Best investment! After I got trimmer went and ordered the blower too. No more pull cords !!! Is it any good at edging lawns? BEST ANSWER: Absolutely! This trimmer is fabulous! I edge all my lawn along the my paver front walk, the concrete driveway, the road edge and all my planting beds. This unit has all the power of a gas model but none of the hassle. Battery lasts a long time and recharges relatively quickly. I also have the hand held blower which is another great DeWalt product. If you normally edge with a string trimmer, this will do the same thing. I use this machine on the low setting and I have no trouble cutting through typical grass/weed material. The high setting is overkill for typical residential work, but it's nice to know you have the power if you need it. Yes, this is a great trimmer and edger. The string is a little tricky to get replaced, but it gets easier the more you replace it. While the product can be used to edge lawns, it is a trimmer not an edger. Can the battery in this trimmer be used in any of the De Walt chain saws or leaf blowers? BEST ANSWER: This should work in any 40V Dewalt tool. This should work in any 40V Dewalt tool. Will this trimmer also work with a dewalt 40V MAX 4.0 Ah battery? Yes, that trimmer will work with the 40V MAX 4.0 battery. Does the string rolled up or just cut to length and put in? BEST ANSWER: It lasts longer than I do, and will do my one acre lot around all the trees before needing charged. The battery also has a gauge on the side to tell you how much power if left. What are the shipping dimensions of this tool? strings? I never have luck with bump and feed. What is the run time on the 6 ah battery model? BEST ANSWER: Run times can vary based on usage, however on full and with moderate use, your run time can come close to 45-60 minutes.